Probably best known for his "astrological" watches, Christiaan van der Klaauw presents a stunning new model for 2011 called the Real Moon 1980. The "1980" segment of the name refers to the fact that the highly limited watch is meant to be an homage to a clock that he constructed in 1980. The piece is stunning, and contains a few complications that I personally have not seen before. The movement starts with one of Christiaan van der Klaauw's base CK1094 automatic movements with the Real Moon module on it. Note the sophisticated looking highly customized automatic rotor that has a realistic looking piece of the moon on it. The movement complications include the time, date, month, moon phase on turning orb, solar and lunar eclipse hand, and declination of the sun indicator. Wow, talk about yet another way to construct a fascinating astrological complication timepiece. The solar and lunar eclipse hand indicates if there is a solar or lunar eclipse going on somewhere on earth - this dial is near 3 o'clock. Using the Christiaan van der Klaauw logo, the sun declination indicator has the logo rise and lower to show the relative position of the sun on the horizon based on the time of year. The dial with two hands at 9 o'clock are used for the calendar functions. A modern looking dial gives way to a classic looking case. It is 40mm wide and offering in 18k white or rose gold - with matching alligator strap. Christiaan van der Klaauw will also offer a platinum version with an all hand-made dial as a limited edition of just 8 pieces. Look for these stunning new Real Moon 1980 watches soon. Ariel Adams publishes the luxury watch reviews site aBlogtoRead.com. 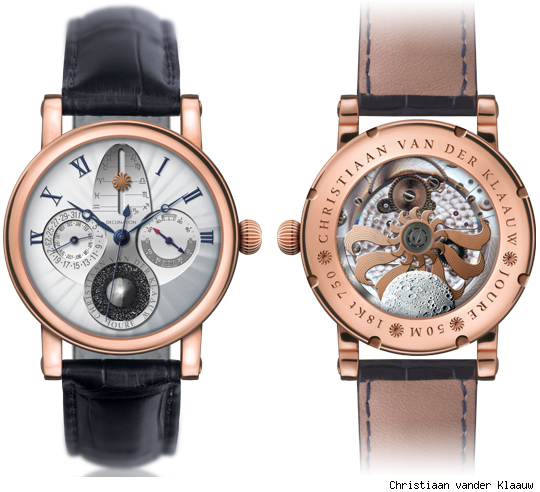 Christiaan van der Klaauw Real Moon 1980 Watch originally appeared on Luxist on Tue, 26 Apr 2011 12:02:00 EST. Please see our terms for use of feeds.